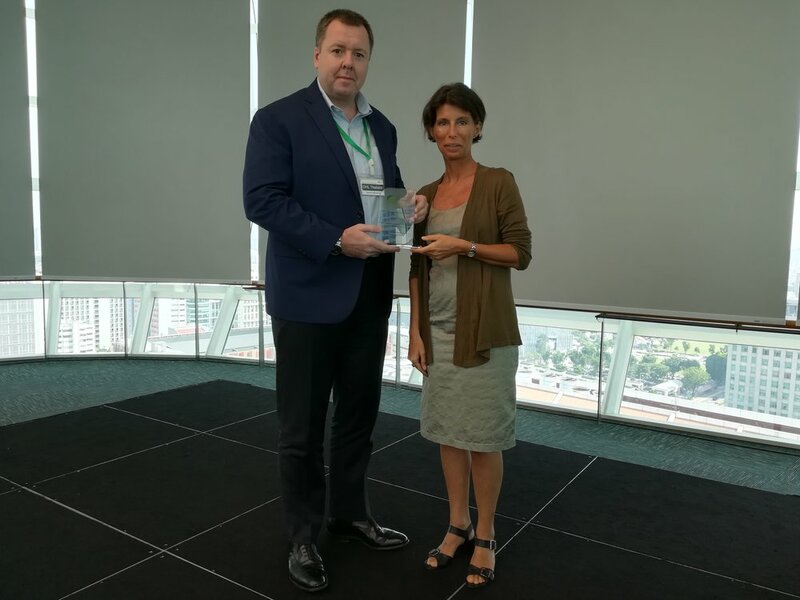 At the GFA Forum 2018, we launched our new GFA Awards, to recognize members who demonstrated an outstanding commitment to the objectives of GFA. The GFA Ambassador Award recognizes members who actively contributed to growing GFA's network and engaging supply chain partners in GFA. SHS is the only SME transport provider based in Singapore that has been certified with the GFA Label-Leaf 1. Heineken was instrumental in the development, design, and launch of GFA's new knowledge-sharing platform this year - the Green Freight Leaders' Society (GFLS). It hosted the inaugural session of GFLS for GFA members and partners where it also shared its sustainability program, 'Drop the C'. Heineken continued to support our events this year. Heineken China was a sponsor of our green freight forum in Shanghai last July. "We are extremely honored to be receiving such an important award. We are grateful for the recognition we have received for our collaboration and we believe this will allow HEINEKEN and GFA to enhance the partnership even further. As a leading global company, we believe it’s our responsibility to reduce CO₂ emissions across the value chain, from Barley to Bar. Our new transformational programme ‘Drop the C’ aims to significantly reduce carbon emissions from across the business, but we simply cannot do this alone. We are delighted that GFA stands by our side and helps us to reach our goals by delivering insightful trainings and unique expertise. Once again, thank you so much for the recognition as well as your continuous support, and we look forward to collaborating with GFA even more in future." Bollore hosted and sponsored GFA's second Green Freight Leadership Society's which gathered trucking companies, manufacturers and technology providers discussing on the future of sustainable road freight practices in the Asia-Pacific. In 2017, IKEA's 10 country operations were certified with GFA Labels. These include Australia, China, India, Japan, Bangladesh, Pakistan, Vietnam, Thailand, South Korea and Indonesia which all formally committed to promote green freight in their operations. IKEA also hosted our forum in Shanghai last July 2018 with more than 60 executives from all sectors sharing information on policy developments, corporate initiatives, and green freight technologies. “These two awards are a validation of IKEA’s collaborative approach to carbon emission reduction in transport. The approach involved managers, purchasing team, sustainability team, and most importantly our service providers.